This was from a race that was done, and is not for the faint hearted or under-trained. Start from the beach, run up the road, through the housing complex and the trail is right in front of you. Once you hit A Po Long (6.3km) turn right towards Pak Mong. At Nam Shan continue straight on to Shap Long – turn left and go around Chi Ma Wan anti-clockwise. Once you get back to Nam Shan turn right to Lui Tei Tong Tsuen. Head back to A Po Long, turn right and head back to Discovery Bay. **NOTE** This was done in a race with checkpoints and many waterstops, If you attempt the whole route you need to be self sufficient! Take more than you think you will need. Guess for a 9-10hr day walking and jogging. 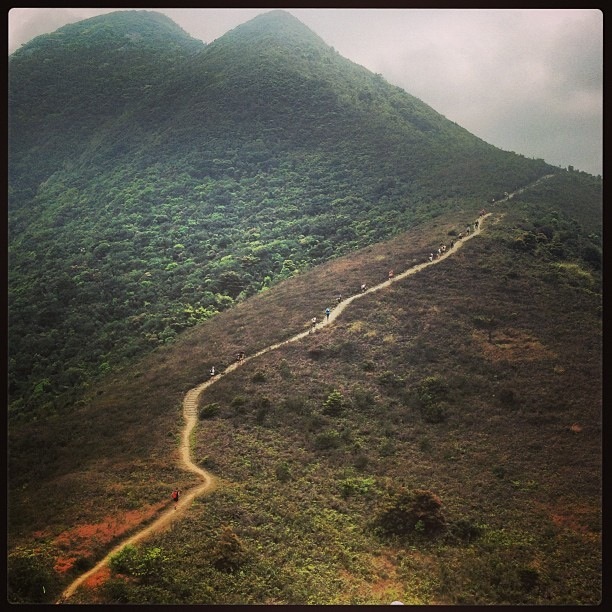 – You could finish at your second crossing at Nam Shan which is 39.6km. From Central ferry pier you can get the ferry from pier no 3 to Discovery Bay. Then you can get a taxi or shuttle C4/C9 from Discovery Bay Bus terminus to the Auberge hotel. When finished, you can get the shuttle or bus back to Discovery Bay Pier and get the ferry back to Central.